MIL Management has been the engine of the outstanding showing by the Company. Through its periodic review of the overall performance of the Company in terms of the volume of business transacted by it, besides the performance of its employees, the Management keeps a hawk's eye on the developments within the Company. The carrot and stick managerial policy of rewarding brilliant performance while coming hard on slackers has been hugely successful in bringing out the best in its employees. Today Murli Industries Ltd. is a household name in India, which is steaming ahead with its mega expansion programme with active involvement of its Directors', who have a huge wealth of experience behind them. Being a major player in the fields of paper, solvent extraction, power generation and cement is a huge achievement by any standard which has been possible thanks mainly to sound managerial policies which are fine-tuned periodically. The following facts and figures give an idea about the unstoppable growth journey of MIL vis-a- vis the role of the Management. Gross turnover for the year 2009-10 achieved on the back of brisk business by the Company rose by Rs. 5,146 lacs to stand at Rs. 57,167.89 lacs. Earning Per Share with face value of Rs.2 per share, for the year in question stood at Rs.7/-. The creditable performance of MIL is ascribable to a number of factors with the role of the Management being the most critical one. 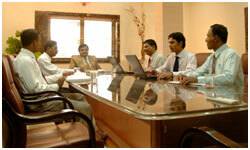 Presently the MIL Management is spearheading its growth campaign which would propel the Company to even newer heights.